While Dish has not really spoken of its upcoming "Hopper" multi-room DVR setup or any wireless broadband plans, it has announced the addition to video on demand viewing to its iPad app, and has updated their own system for Google TV. For users with the Blockbuster @Home package or premium movie channels like HBO, they can log in with their Dish Online ID and use this. The remote viewing portion has also been refreshed, with an updated guide. For Google TV owners, it also announced an official tie-in with the developers of Thuuz to record the live sports programs it alerts users to. LAS VEGAS – Jan. 8, 2012 – [NASDAQ: DISH] – DISH Network L.L.C. announced today it has enhanced its popular DISH Remote Access app for the iPad® to allow DISH customers to watch thousands of on-demand streaming movies and TV shows. DISH made the announcement at the 2012 International CES. DISH customers who subscribe to the Blockbuster @Home™ package or select premium movie packages, including HBO and Cinemax, can now watch popular movies, TV shows and kid's programming using the updated DISH Remote Access app on their iPad. "DISH is known for innovation, variety and value and has raised the bar when it comes to developing innovative ways to watch TV, whether on a big screen TV in your living room or on an iPad at the airport," said Vivek Khemka, vice president of Product Management, DISH. "DISH customers have a wide variety of entertainment options found nowhere else. Our enhanced app makes it easy to watch TV everywhere and delivers the ultimate entertainment experience." Streaming movies and TV shows using the enhanced DISH Remote Access app requires a DISH log-in ID and a broadband-connected iPad. The DISH Remote Access app is available today and is free to DISH customers from Apple's iTunes Store. To watch live TV on the iPad, subscribers need a DISH Sling® Adapter and a broadband-connected compatible DISH HD DVR receiver. More information about DISH Remote Access is available at dishnetwork.com/tveverywhere/remoteaccess. DISH Remote Access app images are available at http://press.dishnetwork.com/Press-Center/Photo-Library. LAS VEGAS – Jan. 8, 2012 – [NASDAQ: DISH] – Never again will a DISH Network L.L.C. customer miss the exciting moments of a great sporting event. DISH has partnered with Thuuz to create an enhanced Google TV application that helps avid sports fans instantly find the best live and upcoming games to watch on television. Using special computer algorithms, the Thuuz Android app for Google TV monitors the excitement levels during broadcasts of Major League Baseball, National Hockey League, soccer, cricket and rugby games, along with both pro and college football and basketball. 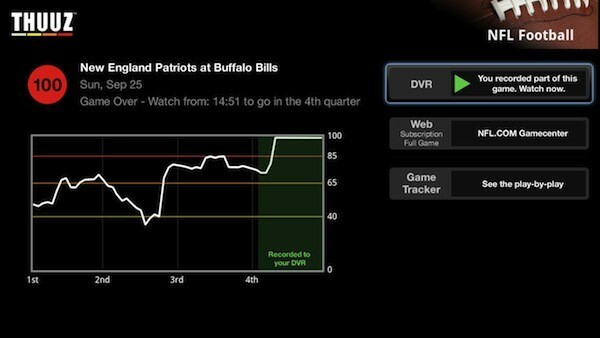 When the excitement level on field reaches a crescendo, an alert pops up on the viewer's TV screen to let the viewer tune to the action. Since DISH is the only pay TV provider to pair a set-top box with Google TV devices, the Thuuz application can also automatically record the most exciting moments of the game for later viewing. "DISH partnered with Google TV to spur innovation in TV apps," said Vivek Khemka, vice president of Product Management for DISH Network. "Thuuz is a great example of an application for the TV that enhances the viewing experience. The power of the Thuuz app comes from its ability to cut through the overload of televised games and take serious sports fans immediately to the best sports action." The Thuuz app uses factors such as parity, pace, novelty, momentum and context in the algorithms that automatically assign an excitement rating to each event. Thuuz comes from the second syllable of "enthusiast." "The thrill of watching sports comes from witnessing the drama and suspense as it unfolds," said Warren Packard, CEO and co-founder of Thuuz. "Instead of just catching the news after the fact, DISH subscribers can now watch the most compelling sports action play out, either live or time-shifted. The combination of DISH's extensive sports programming, Google TV's interactive platform, and excitement analytics built into the Thuuz app deliver an optimal experience for the sports enthusiast." All devices with Google TV and Android 3.1 work with the Thuuz app. The new Logitech Revue with Google TV is available to DISH Network customers for only $99. Customers can order by logging in to their DISH Network account at www.dish.com or by calling 888-590-3684. For more information about DISH Network's Google TV solution, visit www.dishnetwork.com/googletv. For more information about Thuuz, visit www.thuuz.com. See a sample Thuuz app screenshot at http://press.dishnetwork.com/Press-Center/Photo-Library.